WASHINGTON (AP) — Iran is playing a growing role supporting the Syrian regime and is helping to build and train a militia to fight opposition forces, U.S. defense officials said Tuesday. "Any army would be taxed with that kind of pace," Dempsey said. "They are having re-supply problems, they are having morale problems, they are having the kind of wear-and-tear that would come of being in a fight for as long as they have." Dempsey also said that it appears Syrian rebels were able to shoot down a Syrian warplane, but said he has seen no indication that they are armed with heavy weapons or surface-to-air missiles, at least not yet. He says the MiG fighter could have been shot down with small arms fire. Syria has blamed the crash on a technical malfunction, but Dempsey said the cause "didn't appear to be mechanical." 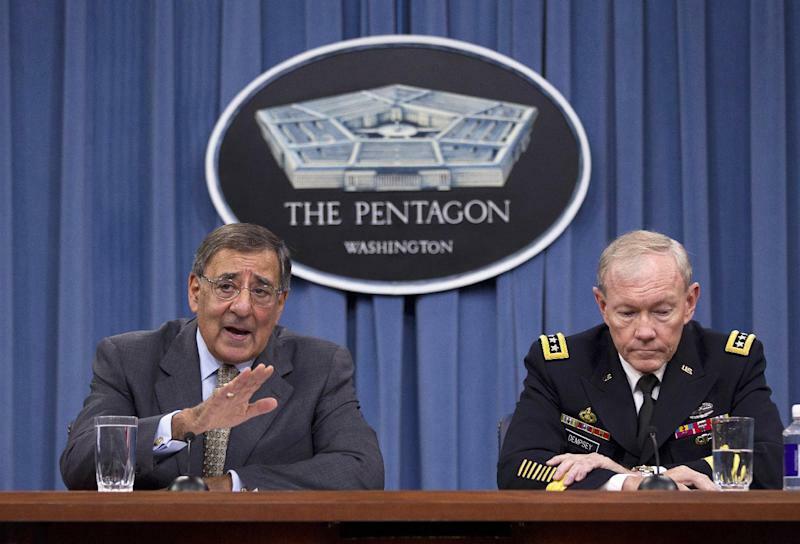 Dempsey and Defense Secretary Leon Panetta voiced concerns about Iran's growing presence in Syria, even as President Bashar Assad's regime steps up its aerial attacks against the rebel forces. Fierce fighting and attacks from warplanes and helicopter gunships have pushed the opposition forces back in key fronts, such as Aleppo. And the fighting — including alleged massacres by the regime — have led to the deaths of more than 20,000, according to activists. Panetta said it has become obvious that Iran is doing more for the Syrian regime, including providing assistance and training. "We do not think that Iran ought to be playing that role at this moment in time," the defense secretary said. He said that "it's dangerous, that it's adding to the killing that's going on in Syria and that it tries to bolster a regime that we think ultimately is going to come down." "And with a safe haven would probably come some form of no-fly zone, but we're not planning anything unilaterally," Dempsey said. Panetta repeated assertions he made during an Associated Press interview Monday, saying that right now, creating a no-fly zone in the region "is not a front-burner issue" for the U.S. Instead, he said, the U.S. is focusing on providing humanitarian and non-lethal assistance and on ensuring the chemical and biological weapons in Syria are secure. A no-fly zone is a militarily enforced area in which outside nations would prohibit Syrian warplanes from flying and attacking its own people. The Obama administration has insisted repeatedly that Assad must go, and that diplomatic and economic pressures, including sanctions, must be given time to work. Defense officials, including Panetta, have warned that putting a no-fly zone in place would be difficult because of the Syrian regime's relatively modern and plentiful air defense systems. In other comments, Panetta and Dempsey said commanders in Afghanistan are taking new, additional steps to deal with the increasing number of insider attacks against U.S. and coalition forces. Panetta said more intelligence officers will be added to the larger military units to help root out possible attackers, and officials will do more in-depth forensic reviews of the incidents, in which Afghan Army or police members — or militants in disguise — attack and kill American troops and other allies. Dempsey said Gen. John Allen, the top U.S. commander in Afghanistan, has created a new team that will review the attacks to determine whether the recruiting process was followed properly, including the required vetting of the Afghan security force members, and whether there were indicators of possible problems that were missed. Earlier this year, Allen increased security measures to protect U.S. forces from such attacks, including a program that assigned "guardian angels" — troops that watch over their comrades — when they are sleeping, working out or doing other tasks. Panetta said Allen plans to meet with Afghan security leaders to talk about any other steps that can be taken, and also is gathering all the senior U.S. and coalition officers for a conference to talk about any other steps commanders can take to safeguard the troops. According to the Pentagon, there have been 37 U.S. and coalition troops killed in 29 insider attacks this year. Of those killed, 21 have been U.S. service members.